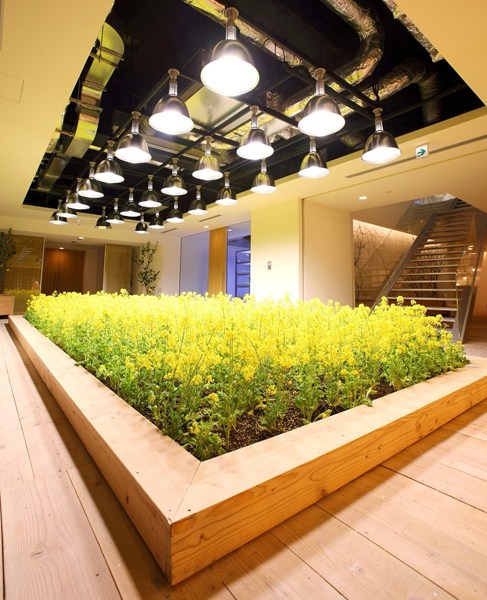 Urban Farm at Pasona Tokyo Headquarters is a nine story high, 215,000 square foot corporate office building for a Japanese recruitment company, Pasona Group, located in downtown Tokyo. 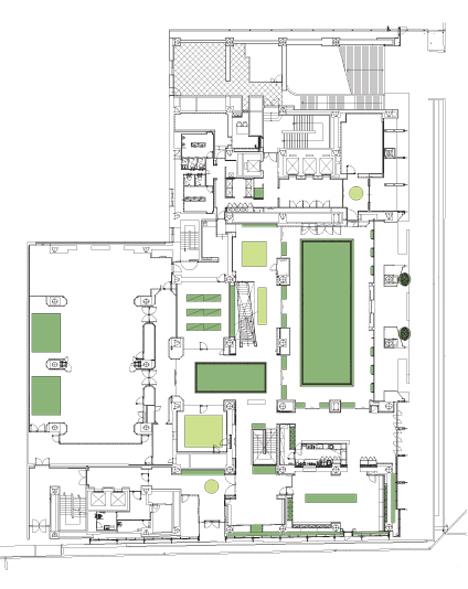 It is a major renovation project consisting of a double skinned green facade, offices, an auditorium, cafeterias, a rooftop garden and most notably, urban farming facilities integrated within the building. 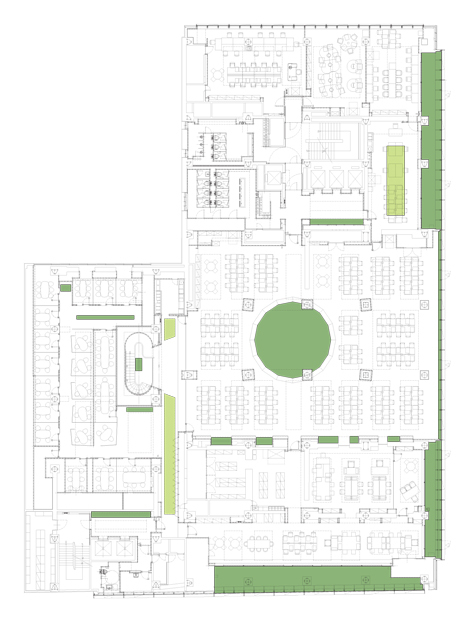 The green space totals over 43,000 square feet(3995 square meter) with 200 species including fruits, vegetables and rice that are harvested, prepared and served at the cafeterias within the building. 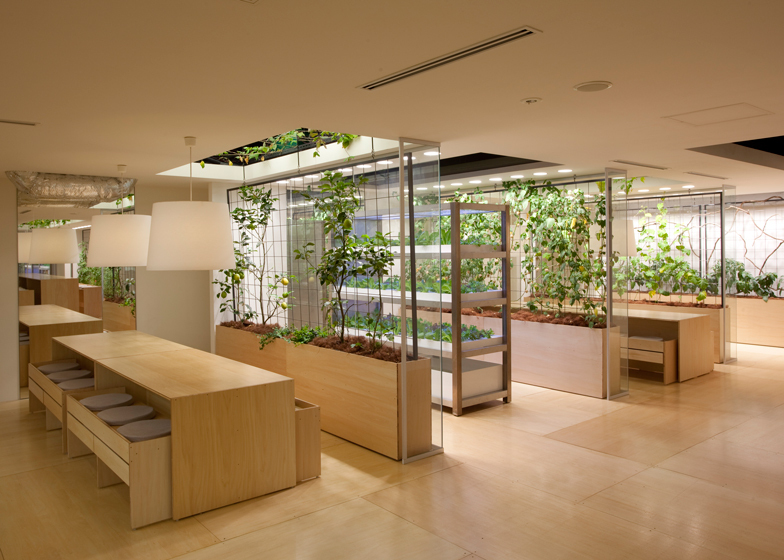 It is the largest and most direct farm-to-table of its kind ever realized inside an office building in Japan. 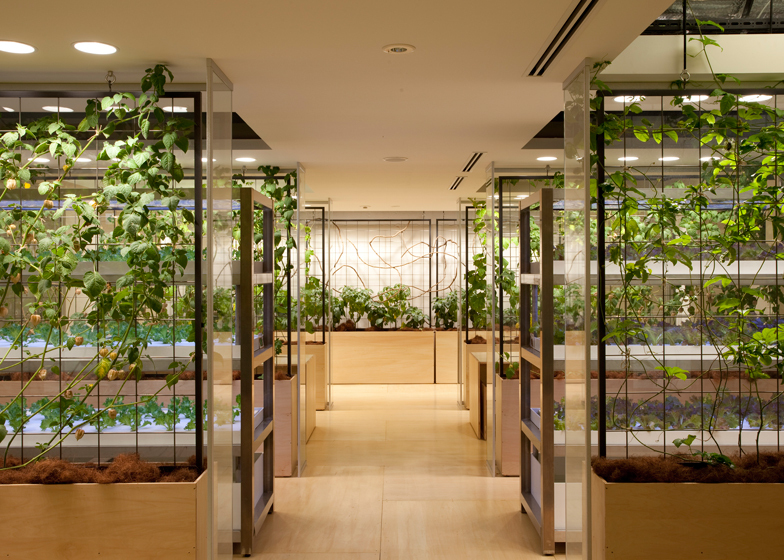 Using both hydroponic and soil based farming, crops and office workers share a common space. 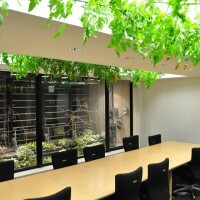 For example, tomato vines are suspended above conference tables, lemon and passion fruit trees are used as partitions for meeting spaces, salad leaves are grown inside seminar rooms and bean sprouts are grown under benches. 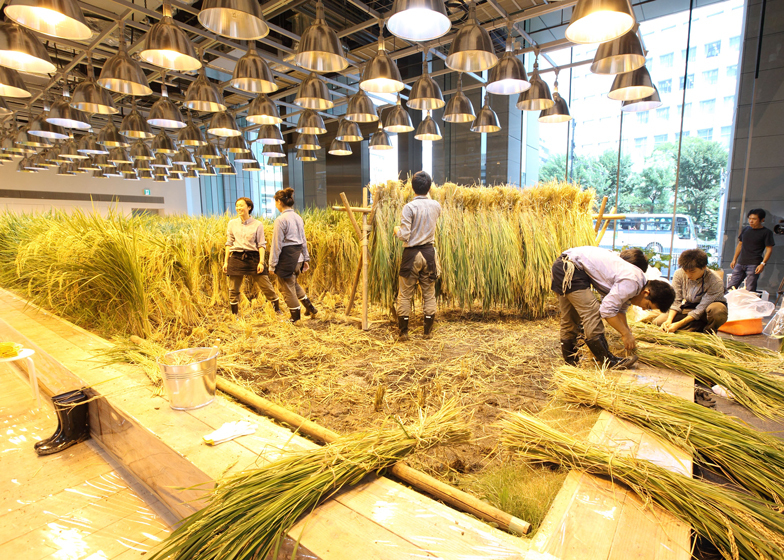 The main lobby also features a rice paddy and a broccoli field. These crops are equipped with HEFL, fluorescent and LED lamps and an automatic irrigation system. 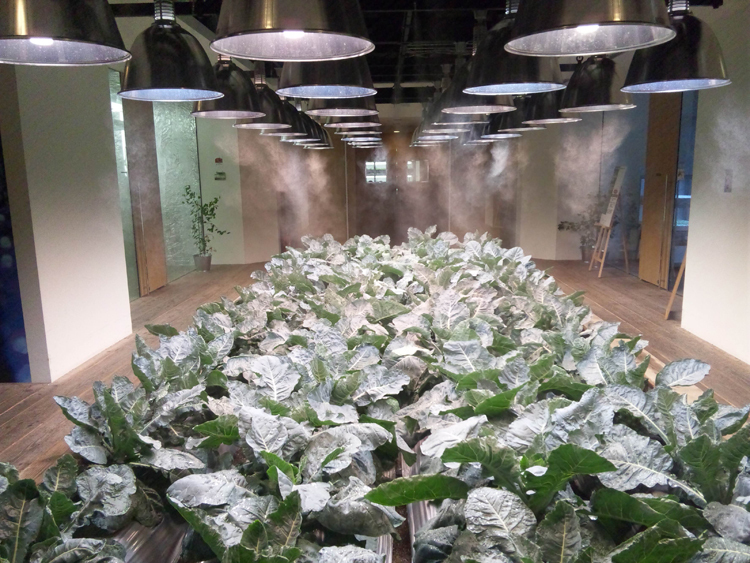 An intelligent climate control monitors humidity, temperature and breeze to balance human comfort during office hours and optimize crop growth during after hours. 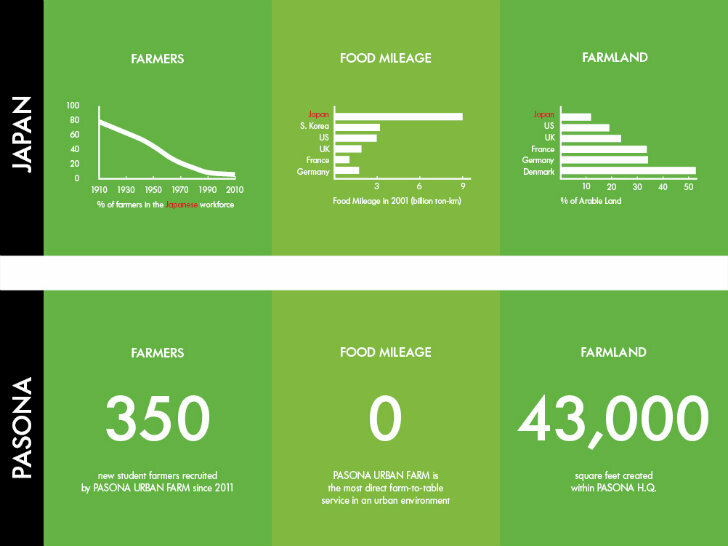 This maximizes crop yield and annual harvests. Seasonal flowers and orange trees are planted on the balconies between the double skinned facade, partially relying on natural exterior climate to showcase changing of leaves and colors to the exterior facade. 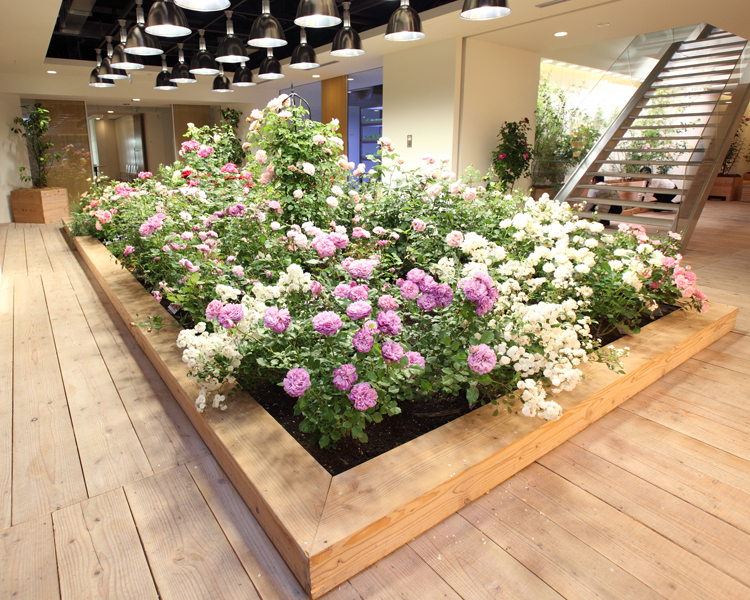 All plants are maintained and harvested by Pasona employees with the help of an agricultural specialist. Pasona Urban Farm is beyond aesthetic and visual improvement. 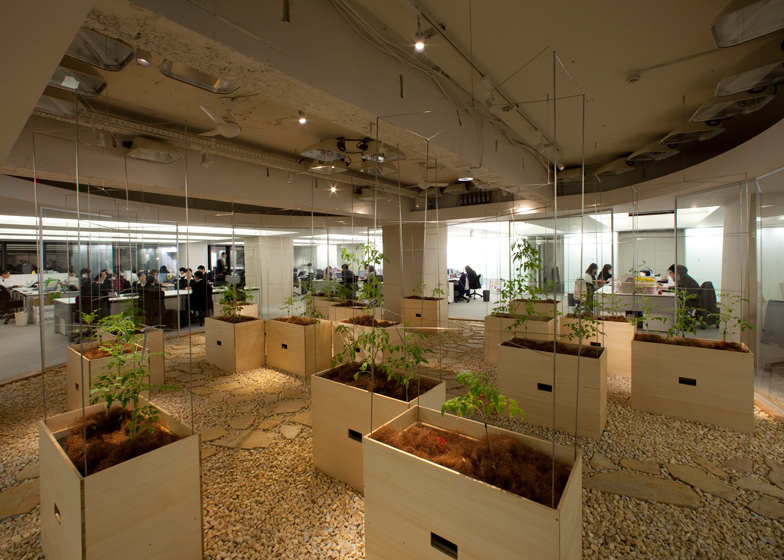 It creates a unique workplace environment that promotes worker’s productivity, mental health, and social interaction and engages the wider community of Tokyo by showcasing the benefits and technology of urban agriculture. Normal Office Building with no green inside the building and on facade. 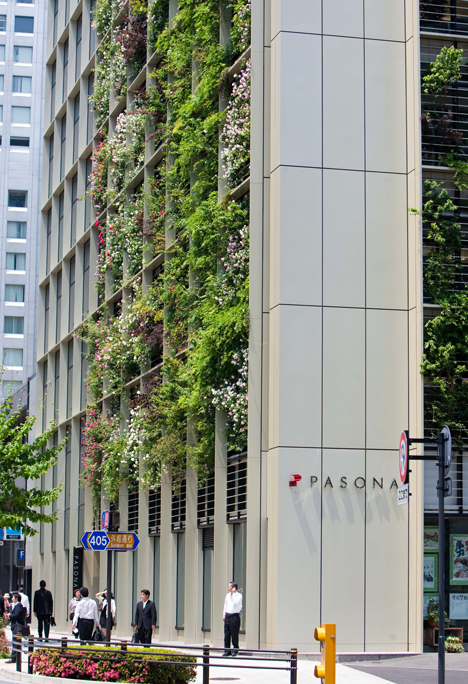 On February 11, 2005, the Pasona Group opened an agricultural facility on the B2 level of its Otemachi headquarters. Located in a space previously utilized as a bank vault, the facility is designed to provide those in the city with a first hand touch of rural life. PASONA O2 is a unique facility, located underground and therefore removed from natural sunlight. 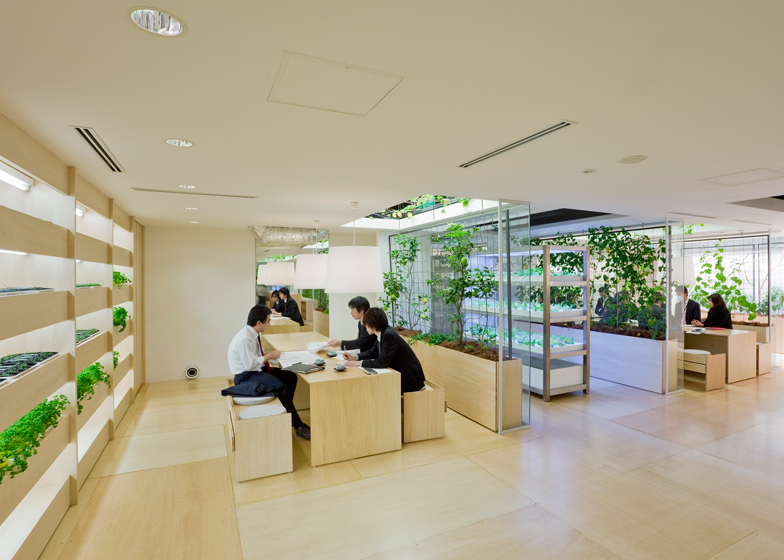 Offering a wealth of plant life and cultivation, the facility is an oasis in the midst of Tokyo’s central business district (CBD). 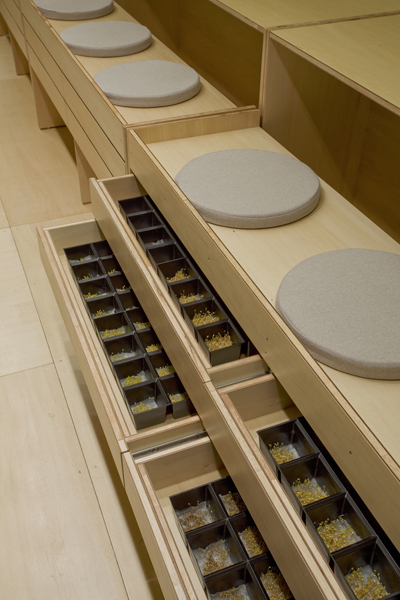 Within the facility, various innovative methods are applied to duplicate the natural elements. 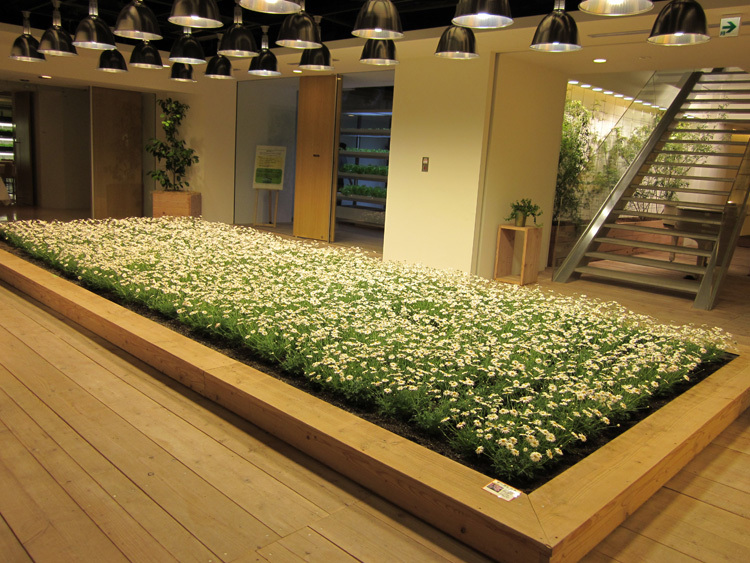 Flowers thrive under the light provided by light-emitting diodes (LEDs). 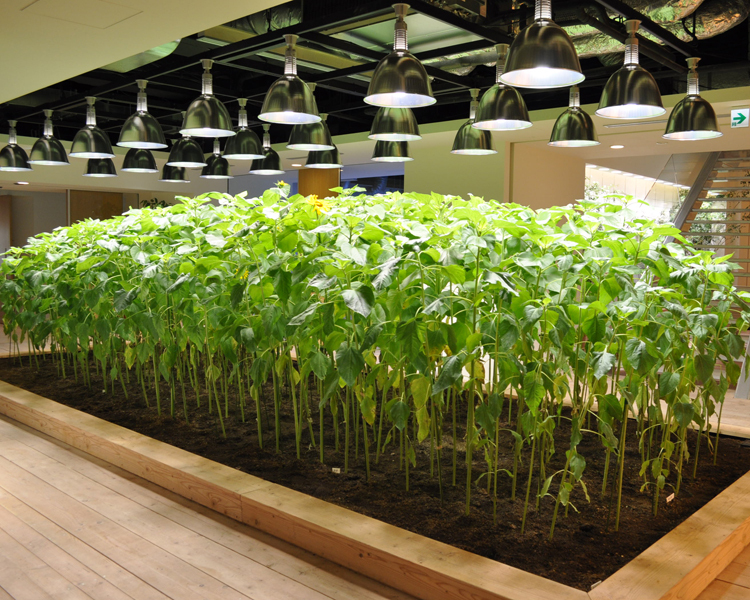 Herbs and vegetables are cultivated utilizing metal halide lamps, and rice utilizing high-pressure sodium vapor lamps. Using a method known as tank farming, or hydroponics, and fluorescent lights, the facility also offers tomatoes and a variety of plants. 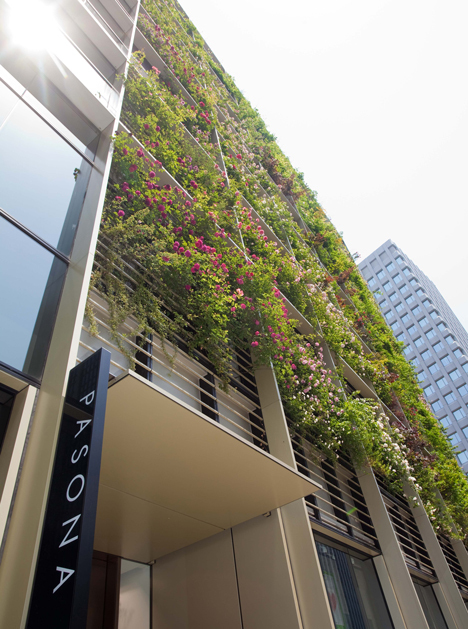 Located in the heart of Tokyo’s CBD, PASONA O2 serves as an information transmission satellite, communicating to an urban audience new pleasures and the potential of agricultural life. The facility not only provides this first hand experience, but also offers a variety of seminars and training programs and a hideaway for physical and mental relaxation. And it produces the most important thing - fresh food! 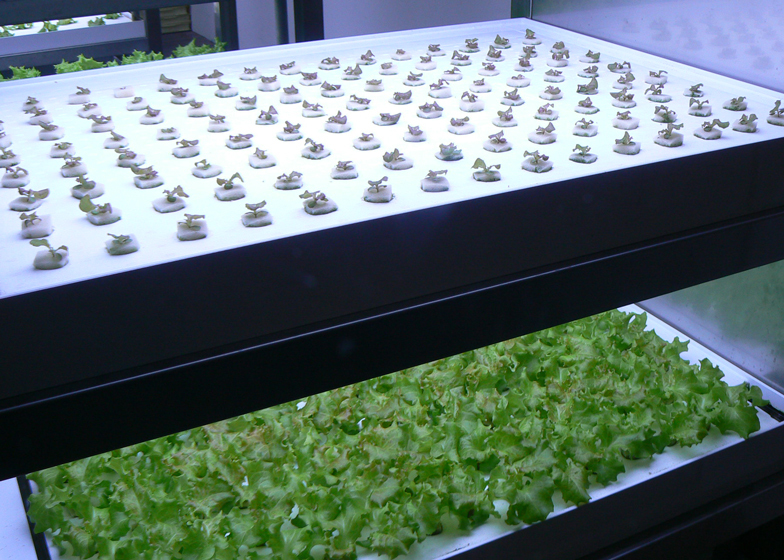 1.It can create 4000 square meter farm land in the city centre. It save time and energy for transportation of food from the farm. 2.Office building has a good heating system and ventilation system, which is the two main qualities of a green house system. 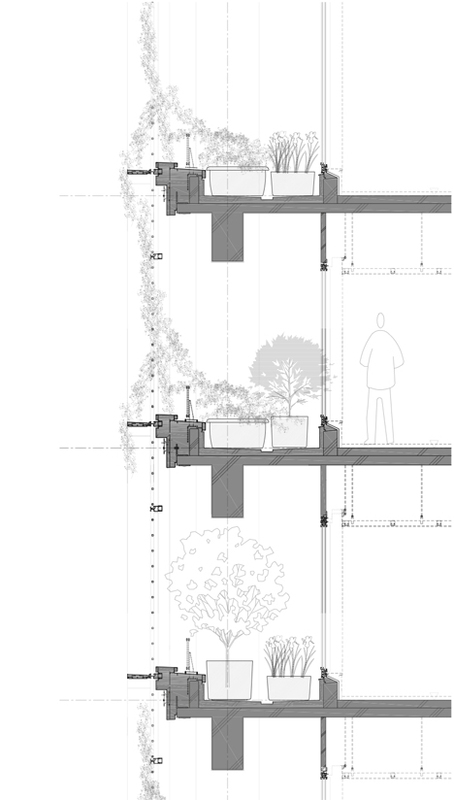 So it does not need to make an other heating system or ventilation system to support the farming inside the building. 3.Office workers enjoy the fun to pick up and plant the food. It brings physical and mental relaxation to the office workers. 4.A better green environment has been created. 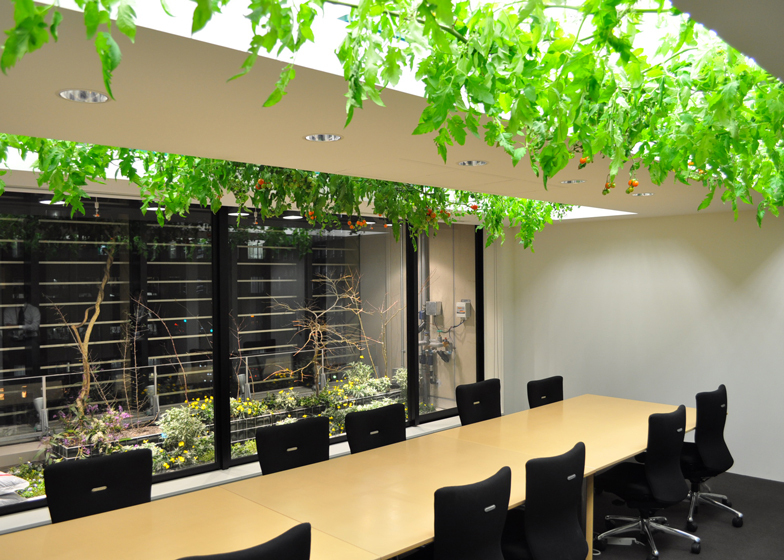 Fresh air are generated from the plants. It spends a huge amount of electricity for lighting system. If they can figure it out how to reduce consume of electricity, the program would be more successful. For example, this may work so well in a good natural light office. 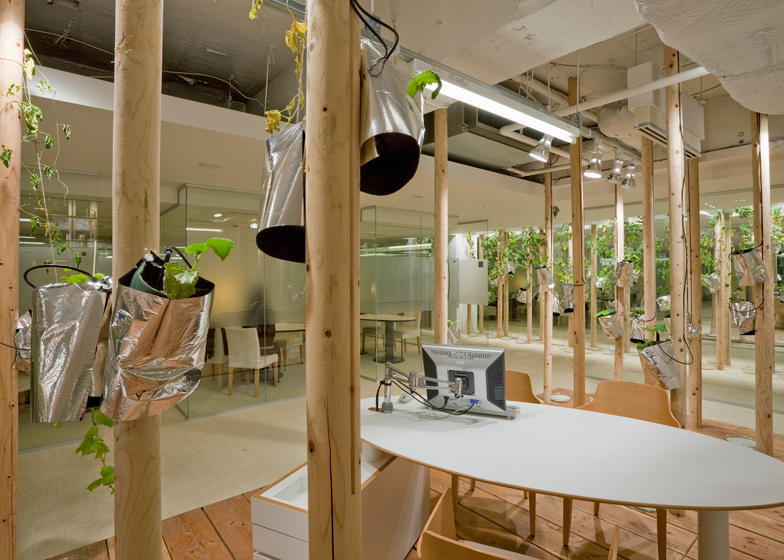 They can use the leftover space and also share the light in the office. 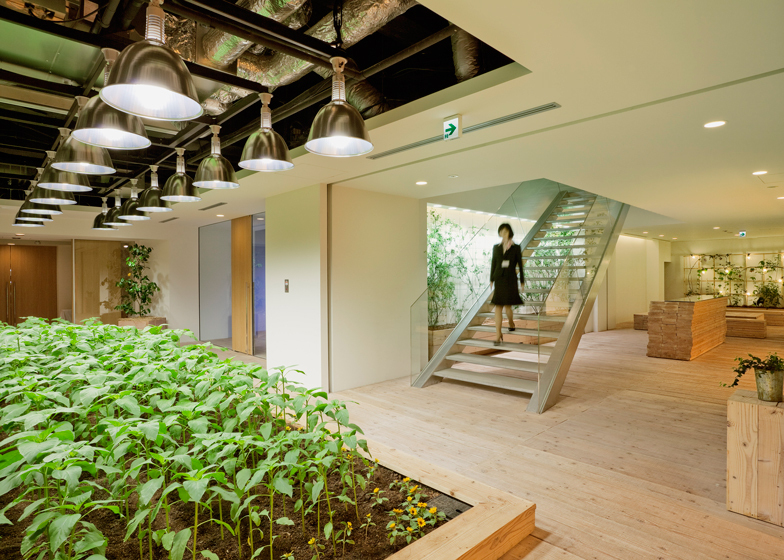 If every office building in Japan create a farm, it would create a lot of farmland. Rice can harvest three times a year. Green part is the farming area.